Hello! Hope your Spring Break was great! Ours was. The girls got to hang out with both sets of grandparents and at my parents house, I got to help my mom finish a few DIY projects. My post today, however, takes place back here at home. The week before Apartment Therapy came for pictures, D.Lawless Hardware sent me some new cabinet goodness. I have actually ordered from D. Lawless before. Way back when our kitchen was black on the bottom, I bought green glass pulls from them. (sorry I can't find a picture..) I researched for a long time and they had the best prices on glass hardware. I highly recommend them and browse their selection anytime I have a need. 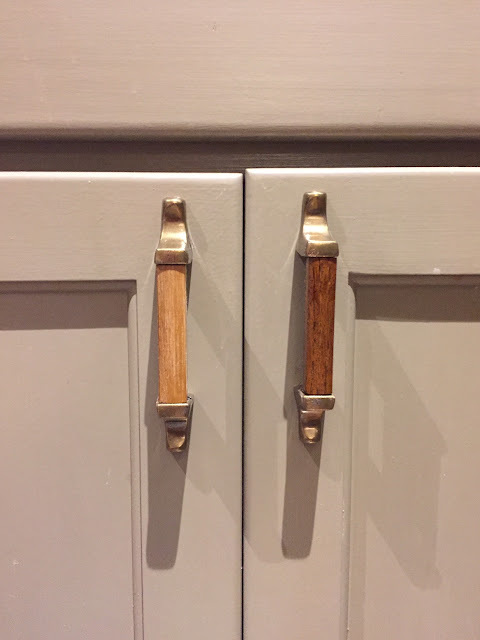 Our kitchen had nickel hardware before and it was very pretty but I've been wanting to add a bit of brass into our decor and I feel like hardware is always overlooked as a pretty inexpensive way to update a kitchen. Maybe people add new hardware when their kitchen is really outdated but you can even just switch it up from time to time to give your kitchen a new look. I browsed and picked these knobs and had previously seen these pulls over on my friend Cassie's blog and fell in love. They're brass and included my love for warm wood tones! No brainer. 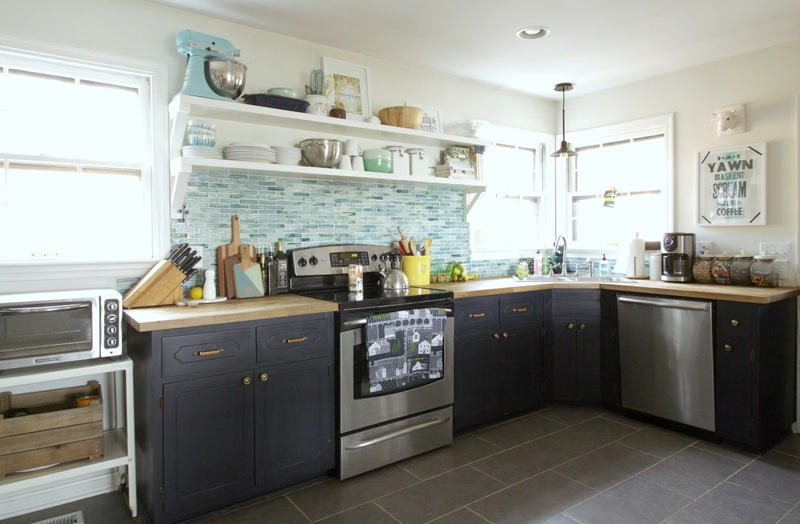 I loved them so much in Cassie's kitchen that I was kind of surprised by how orange they originally looked in our kitchen. They don't read that way at all in hers and didn't even look orange when I pulled them out of the box. I think it's our cabinet color that made them look that way. 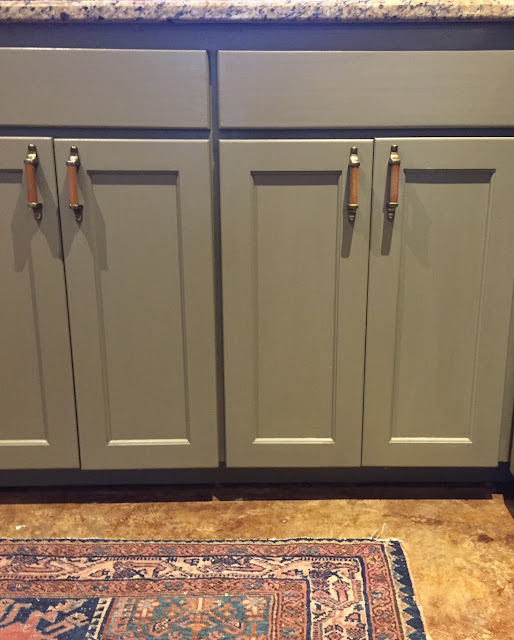 I painted these lower cabinets Behr "Village Square" back in 2014 and I still really love the color. So, instead of returning the pulls, because I loved the shape and style. I did what I do all the time. I "customized" them. I changed them to look good in our house. I grabbed a nail file and sanded down the clear coat. 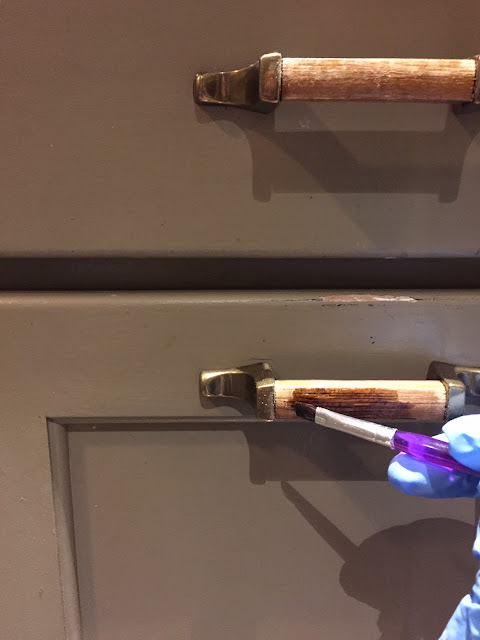 And used a little paint brush to add some of my favorite color of stain to the handle. In the picture below, the left side is the before and the right side is with the little bit browner stain over top. I let the stain dry overnight and in the morning, I painted a quick coat of this over the stained portion to seal it off. I love them! I love how they tie in with our wicker pendant over the sink. My sweet man asked me what you might be thinking: What about the faucet? Is it ok to mix metal tones? And I say, of course! There are enough nickel accents in our kitchen that the faucet isn't left by itself. Especially if you have stainless steel appliances to bring in the silver tones. Mix it up! It's all good. As long as you have a few of each color metal in a space, and maybe keep the number of finishes to 3 or less, I think you're ok. I really love the pulls and I'm so happy I figured out a way to make them work for us. This style would look amazing on a white cabinet or I can picture them with a warm grey, green, turquoise, or navy color like Cassie's. A great part is, at around $50, in a couple years, if the brass trend is gone, we can just go back to what we had or start fresh again. It's not really much of a commitment in turn for a pretty great statement. D.Lawless generously provided me with the hardware for this quick update. I was not otherwise compensated and the deep thoughts and opinions are my own. Thank you to D.Lawless for my new favorite hardware.